Our anti-slip tape is a fast, efficient and inexpensive solution for places where safety must be optimized right away. Our tape is available in several colors, and it is both durable and non-slip. Our tape is available in both single color, but it is also possible to get in two colors. We sell many rolls anti-slip tape in the color combination of yellow and black, because this color combination captures ambient attention and reminds people to be careful. Where is non-slip tape used? It is easy to mount our anti-slip tape on several different surfaces. It is therefore possible to use the tape in different places. Let's review some of the typical locations that typically benefit from being secured by anti-slip tape. 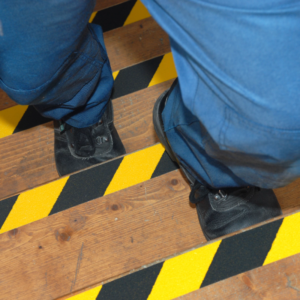 Often, anti-slip tape is an ideal solution for securing stairs, floors and walking areas, as well as for marking walking and driving areas. We have many different floor markers that can help to alert the environment to potential hazards. All of our floor markers are of course also non-slip and are available in different colors and sizes. Floor markers are a perfect addition to security boards and the like. One can not be sure that one's employees are looking at what's on the walls, but if you repeat the warnings on the floor, there is obviously a greater chance that employees will be aware of these and that accidents will be prevented. Our selection of floor markers is large and diverse, and we also gladly produce distinct floor markers that meet our customers' exact requirements. Some of our most popular floor markers are yellow triangular pictograms that communicate that trucks are being transported in the vicinity. Heard about the Aqua-Safe series? We offer a strong and complete range with or without slip protection for both industrial and public areas. For irregular surfaces, we offer a "moldable" tape that can better follow the substrate. The Aqua-Safe series is ideal for providing security in bathrooms, on boats and in other areas used with "bare feet". Take advantage of our expertise in anti-slip solutions. Together with you, we tailor the solutions to suit your business' needs. 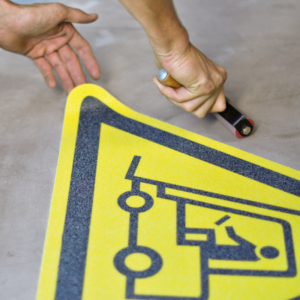 The entire team at Real Safety has broad knowledge of safety optimization, including the non-slip tape and floor markers. Therefore, we can answer most questions in this area. Should you have any questions regarding anti-slip tape and/or floor markers, we will gladly make our expertise and knowledge available to you. We can be reached both by phone and mail. Call +45 26 11 44 66, or send an email to realsap@realsap.com.